When you think Melton Mowbray, you think pork pies. And a fine example of pork pies in the town are from Dickinson and Morris, which we have already highly rated. 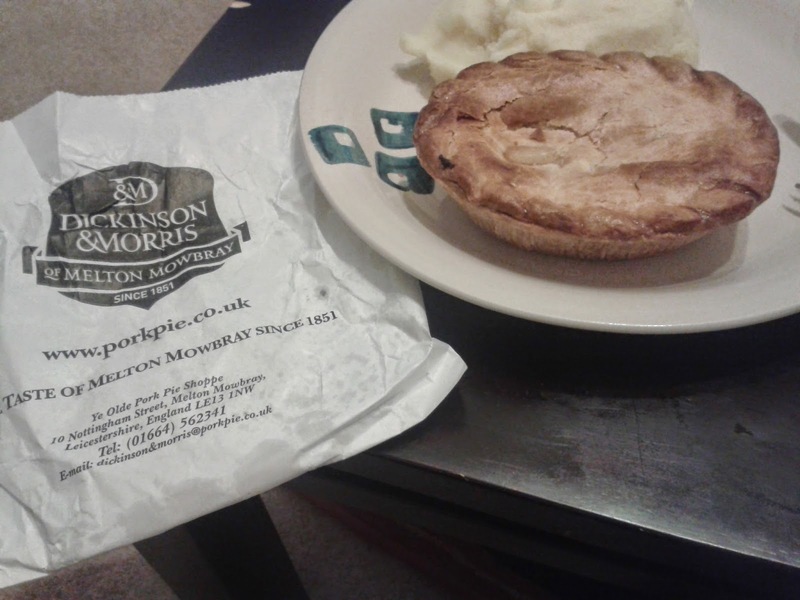 But while being in Melton Mowbray to attend the British Pie Awards 2014 – where Pierateer TJP was one of the judges – the Pierateers couldn’t help but look for pies to eat and rate after the proceedings had finished. 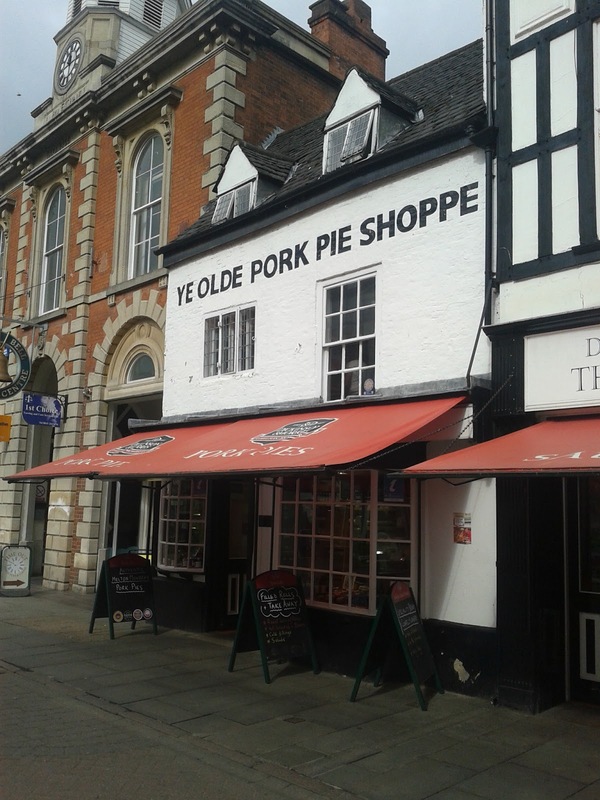 Entering Ye Olde Pork Pie Shoppe, they found alongside the pork pies some meat pies and purchased a creamy chicken pie. The Dickinson and Morris pork pies got a cracking 6.14/7 (Pierate Highly Recommended) when we rated them! Check out the review of their Mini Melton Mowbray Pork Pies. The pie is sold as containing tender pieces of chicken breast in a rich creamy sauce with onion, encased in shortcrust pastry. As you can see from the photo the pastry colour is quite nice and golden, though slightly uneven in shade. The top pastry was a little too crisp around the edge crimping but in general was a nice texture which was firm enough to hold in the filling. The content was nice tender chicken meat and the sauce was lovely and creamy. 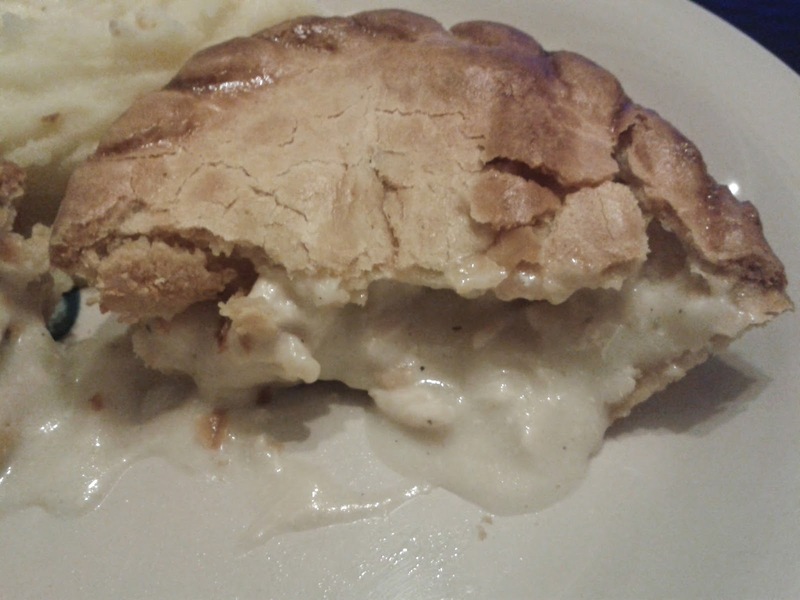 There was a good quantity of creamy filling to give nice flavour to the meat, helping to balance out the slightly dry outer pastry and thus making it a nice pie to enjoy. At £2.15 each, this is quite reasonable for a meaty chicken pie of this size, though I would have liked a slightly better capacity of meat to balance out the slightly pastry-heavy pastry:filling ratio. However all things considered this was a very nice Pierate Recommended pie and considering their main focus is pork pies, I’d certainly commend Dickinson and Morris for being much more than just pork pies!